Long before every other backpack on campus and every second piece of luggage on the airport carousel carried the highly recognizable Swiss Cross, Whoville worked with the brand owners to hone a strategic market positioning and go-to-market plan. 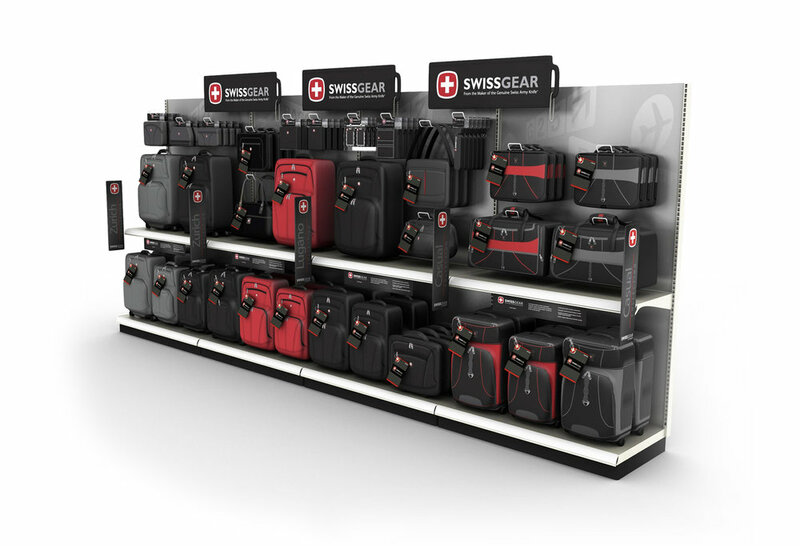 We then developed the design language and retail assets that helped turn SwissGear into a retail juggernaut that went from $0 to $90+ million in less than 10 years. Over that time Whoville also created several brand extensions that were developed beyond the SwissGear brand positioning and parlayed the success of the SwissGear brand into new markets, product categories and retail channels. The near-term explosive launch and the long-term, sustained growth of the family of Swiss brands is a great example of how Whoville partners with our clients. Whoville is ready to take your brand or company on the same kind of thrilling successful journey! Below is a small sampling of the many projects Whoville has created for SwissGear. CLICK TO SEE MORE RETAIL MERCHANDISING & DISPLAY DESIGN FROM WHOVILLE.